Acadia Stairs makes both interior and exterior spiral modern and contemporary staircases. Spiral staircases are not only aesthetically pleasing; they can also serve a variety of needs and purposes. 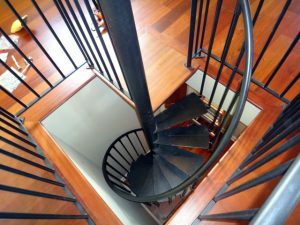 Acadia Stairs has worked closely with many clients to help create custom, modern and contemporary spiral stairs for their home or commercial building. With years of industry experience, there is not a job too big or too small for our company to handle. Clients most often use our modern and contemporary spiral staircases, equipped with a center pole, as stairs for a loft or basement, or we can create larger ones for commercial projects. However, the options are limitless if this is a look you want to feature in your home or business. Additionally, we make curved staircases, without a center pole, and they have a nice sweeping look to them. 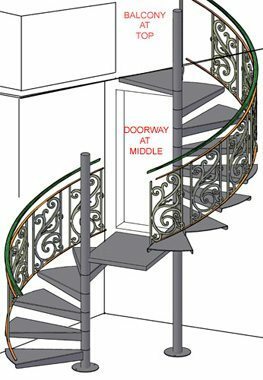 Please see the pictures and descriptions of our examples below for a better indication of the type of spiral staircase designs we can do for you. Also, please keep in mind that our stairs are built precisely to shop drawings, ensuring our customers receive exactly what they had in mind. This 8 line rail stair is a great way to accentuate the spiral look. The top handrail is 1 1/2″ round for an easy grip. The lower lines are 3/4″ round for a lighter look and are spaced less than 4″ apart for safety. We can provide wood tread covers in nearly any species. Our standard tread is a select grade red-oak tread, finish sanded to receive your stain or clear coat finish. We can also provide; white oak, cherry, mahogany, walnut, pine, plywood, or you can provide your own wood tread covers. We specialize in custom made, modern and contemporary spiral stair kits. Each stair is tailor-made for the situation into which it will fit. We work with you to make sure that the stair will fit your measurements, layout, codes, decor and of course your budget! 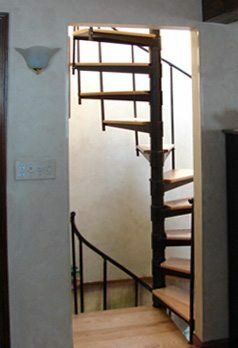 Custom made kit spiral stairs are great for interior applications. We fabricate the stair in our shop & pre-assemble the stair. The stair is then shipped in knocked-down form. This makes the stair easy to get into the location and easy to put together. We make simple spiral stairs with clean lines and an open look. This stair features a 1 1/2″ round steel handrail, 3/4″ round balusters, flat plate treads with oak tread covers. This is a 42″ diameter spiral staircase with a mahogany platform and mahogany treads to match the upstairs flooring. The mahogany treads wrap around the pole for a finished integration at the center pole. The railing on the upper landing and around the opening is custom made to fit the layout and dimensions of the project. 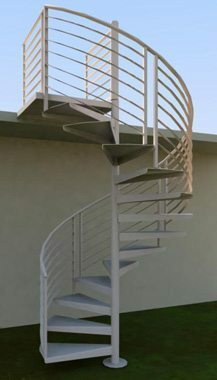 The 1 1/2″ round steel spiral railing is rolled to the rise & run of the stair. 2 balusters per tread reduce the spacing so that it is safer. The riser sleeves are custom cut to the exact height needed. The riser sleeves stack exactly on top of one another, creating a smooth look at the center pole. This picture shows a spiral stair kit knocked down and ready for pick-up at our factory. 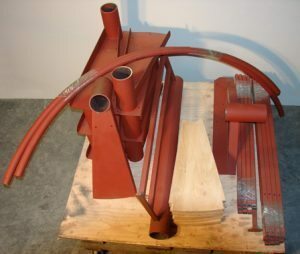 All the steel components of the stair are primed with a Red-Oxide primer that inhibits rust. This also allows the customer to finish paint the stair in a wide variety of colors. The oak treads are natural & must be stained or sealed before in the field. Kit spiral staircases are easy to ship. When fully packaged, they only take up as much space as an average pallet. The center pole is not pictured here, as it ships loose. The typical center pole is about 1 foot longer than the total floor height. 1. Select grade oak tread cover, nosed front & back, notched for tread-to-tread balusters and cookie-cut for the center pole. 2. 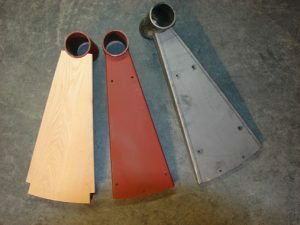 Smooth plate steel tread, with red oxide primer, pre-drilled for wood cover and for 1 middle baluster. 3. Smooth plate steel tread, unpainted, pre-drilled for wood cover & drilled for 2 middle balusters. Exterior spiral stairs are a great way to add an architectural detail to the back yard, deck or patio and create a modern or contemporary feel. We make industrial exterior stairs in steel and hot-dipped galvanized steel. We make high-end stainless steel spiral stairs to stand up to the harshest environments. The stair shown here features a mesh-style rail for an interesting way to have an open look and added safety. You can choose from a wide variety of treads; smooth plate, diamond plate, perforated plate, pan-type treads, stone, exterior decking and more! These stairs can be made in 1 piece, or as a custom made kit, depending upon your logistical needs and freight costs. This heavy-duty spiral staircase is a precision made kit. We fabricate the railing on the stair in one piece. We then separate the railing sections and insert connectors for easy re-installation. The bottom of each post has a large nut welded inside for attachment to the steps. Each tread is welded to a riser sleeve that is custom cut to match the exact riser height needed for your project. The platform railing at the top of the stair is also made to match the spiral handrail style. We can also make matching deck railing that will be pre-fit to connect with the platform railing. 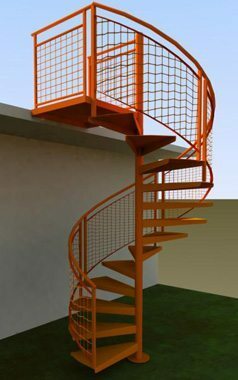 The heavy-duty exterior spiral stair is available in steel or stainless steel. The stair treads can be smooth plate (to receive decking material cover), diamond plate, grating, perforated or a pan-type tread (for concrete fill). 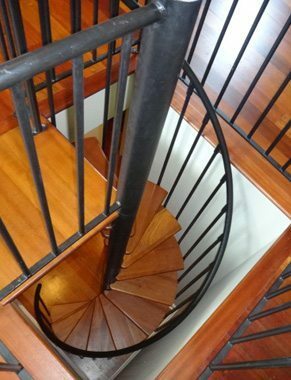 We can prime the spiral staircase with a rust prohibiting Red-Oxide or Rustoleum flat black primer. We also offer the stair in many finish colors and powder coat options. We have parts for adjustable kits that are available right away. The Ready-to-Go Spiral stairs are available in 4′-0″ diameter and 5′-0″ diameters. These kit spiral stairs can be configured to go down clockwise or counter clockwise. We can provide a stair to work with almost any height, from just a few steps to multiple flights. The Ready-to-Go stair is available with wood treads, smooth plate treads or anti-skid tread plate steps. We can provide a simple PVC handrail, or we can pre-form a steel handrail to your specifications. Acadia Stairs believes that finding the best layout is as important as getting a railing that matches your decor. We build each one of our modern and contemporary stairs to suit your project’s needs. We focus on making the safest and most comfortable stair to get you from point A to point B. Our stairs can even have intermediate landings if necessary. We can provide a 3D rendering of your stair design before we enter the shop drawing phase. This helps you envision the staircase in its environment. We make sketches like these to show the railing and tread designs as well.